Ready For Download: The ArtScroll Digital Library! Home › About Us › News › Ready For Download: The ArtScroll Digital Library! Suffern, New York - ArtScroll Mesorah Publications and RustyBrick is pleased to announce the ArtScroll Digital Library is now available for download in the Apple iTunes App Store. This much anticipated Talmud App has been the talk of the Jewish community for almost six months. After several months of development and countless lines of code, the Schottenstein English Talmud is now available in digital format for Apple iPad users. 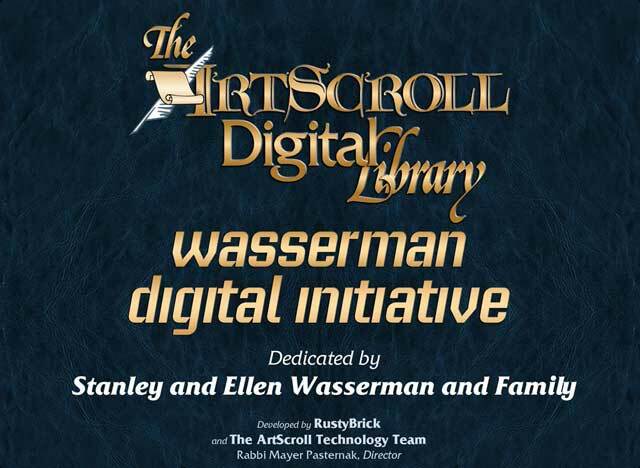 The ArtScroll Digital Library - Featuring the Schottenstein English Talmud a Wasserman Digital Initiative - is a revolutionary new way to study the Talmud! Ground breaking technology enhances the best selling Schottenstein Talmud - and will allow you to study the Talmud in ways never before possible. New features like Page-Syncing, Place Tracking, Page Fusion, Floating-translation, Quick-Scroll, resizable text, automatic-delivery, subscriptions - will transform your learning experience! "Working on this app with ArtScroll may be one of the most meaningful projects we have worked on in a long time," said Barry Schwartz, the CEO of RustyBrick. He added, "taking 2,000 years of content and bringing it to life through Apple technology will change the lives of so many people. This will change how adults and children learn; it is really a revolution in the Jewish world. The most exciting part, this first release is just the beginning. What we have planned for future releases will amaze you." Ronnie Schwartz, RustyBrick's CTO said "RustyBrick's designers, developers, security engineers and system admin's really went all out on this app." "Mayer Pasternak and the entire ArtScroll Technology Team really did a fantastic job describing the entire Talmud and it's interlinkages into the XML structure we use in the app," Ronnie added. In terms of the complexity of the project, Ronnie explained "there were so many parts of the puzzle that made this a truly extraordinary challenge: Usability, Typography, Security, Web Services, Cloud Infrastructure, Localization and of course Torah!" You Automatically get the first 7 Blatt/Daf of Berachos when you install this free app. The new Hybrid page will allow you to study directly on the Vilna page - with popups that can be configured to show you the translation, notes right on the Vilna page! Daf Yomi Purchase Subscription - sign up to get automatic access to that month's Daf Yomi content and have the pages added to your library forever! Subscription automatically renews every month. No need to go back to the store!